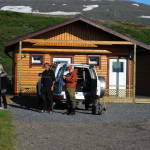 Iceland Fishing Guide – Fly fishing in Iceland – Salmon fishing in Iceland – Arctic char fishing in Iceland – Brown trout fishing in Iceland » Jökla & Fögruhlíðará (Salmon fishing). The Jökla river system is a relatively new salmon fishing destination which opened after the big dam at Kárahnjúkar was built and the dirty glacial melt waters were held back. The river Jokla now runs clear for most of the Season, but in late season warm weather the dam can overflow. The joy is that even if this happens we still have three further rivers to fish! Iceland Fishing Guide has made an arrangement with Strengir, the operators of the Jökla river system and has exclusive access to a number of prime weeks for the coming season. When we made our test trip there in 2011 we where amazed by the extent of the fishing area as well as the number of salmon running into the system. The smolt release program continues and every year should see further improvement. We had 3 full days of fishing and caught 9 salmon on our shared rod so it was not a hard decision to make this our number one destination for salmon fishing. Our first full week in July 2012 saw a group of 8 anglers catch 49 fish for their week, in unseasonably warm conditions. The top rod had 6 fish in one morning session in the stunning canyon pool Steinbogi. The fishing in the Jökla tributaries is one of the most extensive salmon fishing systems in the world and offers a fantastic variety of fishing on four rivers for both single and double handed rods. The river is about 3,5 hours from Akureyri or about 20 minutes from the town of Egilstaðir. The Jökla is the biggest. A perfect river for either spey casting or single handed 7-8# rods. The Jökla river offers about 40km of double bank fishing – more than enough to satisfy the four rods fishing it. A lot of the area is still unexplored and we find exciting new pools every Season. In 2012 the original fishing area was expanded with the building of a salmon ladder about 30km upstream. We visited the pools above the salmon ladder in September and noticed that a lot of salmon had migrated up there, so we have high hopes for the coming years. Kaldá is the second largest of the rivers about half the size of Jökla. It is a really lovely, classic small salmon river with many picture perfect pools and runs gin clear. In many places you have the opportunity to spot salmon from the high banks before heading down to the pools and casting to them. Kaldá is perfect for the modern switch rod, but fishes equally well with a single or double handed rod. Kaldá is about 20km long so the 2 rods allowed have plenty of space. Fögruhlíðará is a small river which meanders gently across the estuary grasslands and allows you to get right up close to the salmon. The river is perfect for single handed fishing with small flies and riffle hitch. The salmon can be tricky in such close proximity, so stealth is paramount and you can have amazing fun trying different tactics on fish you can see in the pools. Laxá is similar size as Fögruhlíðará but different in flow. 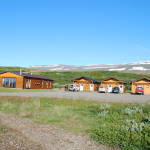 A small, rocky spate river, the Laxá has pool after pool, perfectly made for fly fishing. Although it relies on rain to have the desired flow of water, there is an impassable waterfall pool that always holds a serious head of salmon.